The New Order of Highsec continues to stack up victory after glorious victory. This week, Apo123 purchased 370 additional shares of New Order stock, which brought us past the 1,593 billion isk mark and earned him a Supreme Protector's Tip of the Hat™. But our Agents weren't done yet. The Lawton School for Pubbies Who Can't Mine Good bought 1,000 more shares of New Order stock, triggering the victory of taking us past the 1,594 billion isk mark. That's a lot of stock, by the way. The School added another Supreme Protector's Tip of the Hat™ to its collection. But is there a need of such a school? There is. In the New Order, our institutions aren't isolated from the people; you can't characterize them as ivory towers. Our Agents deal not only in theory, but reality. Here's a typical example. Agent Lawrence Lawton brought gankers from his School and ganked a miner--triggering other miners in the system. The ganked miner, Erik Rebar, lost a 378 million isk Hulk and was podded for good measure. The offending bio. Erik's philosophy was but a smokescreen for his true desire: a risk-free highsec. Lawrence began to use Erik as a teachable example. The miner himself had not yet spoken, but others of his rabble were roused by his death. Finally, Lawrence got Erik on the line. The miner was salty about something, and Lawrence aimed to find out what. Our Agents understand that miners need more than death; they need to accept that their deaths are deserved. Erik bristled. He knew he'd never be able to mine AFK in peace. He might get away with it for a time, but he'd always have a fear of Catalysts looming over him. He wouldn't be able to enjoy being AFK. Yes, the highsec miner needs an education. And the best way to educate them that we've found so far is destroying their stuff and giving them the Code. I am reporting that idiot, thanks for the screen shots. I would be disappointed if the Professor didn't do his duty and report the idiot also. It's not only the right thing to do according to the TOS, it's the moral thing to do for the community. Yes a petition was filed. Nobody deserves such abuse for winning a round of PvP. And rightfully so LL. We must take a strong but fair stance on that type of criminal behavior. The game has rules for a reason, and as dutiful citizens it's imperative that we not ignore avoidable threats to our community. erik rebar types will never belong in EVE and there's no point in continuing to waste their time or our resources on a lost cause. CCP should doomhiem any character that acts like such a shitter. For the player's own sake, at least make them start with a fresh character so they can hide their shame. Or maybe brand a giant letter S, for shitter, in their bio every time they break the TOS so the rest of us know who to shoot first. EVE is not for everyone, and if someone's first response to proper gameplay is to start acting like erik, then they are playing the wrong game the wrong way. Failing daily and bringing down the entire game. Why is it that shitters think the correct response to PVP in a PVP game is to start yelling obscenities? Oh yeah, it's because they're shitters. CCP owes it to the playerbase to protect us from emotionally unstable idiots who think RL violence is an acceptable response to losing in a video game. 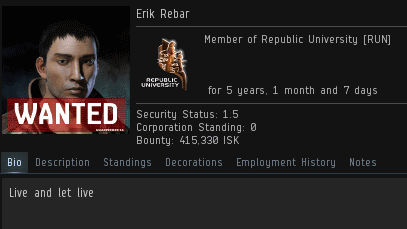 If CCP refuses to permaban people like erik then it's our duty, as law abiding citizens of highsec, to encourage those shitters to find a new game. For their own mental health, and the security of our community, they need help realizing that EVE is not for their kind. Die carebear scum, die. We don't need you, or your sicko strawberry-picking fantasies here. Calm down miners, and learn to EVE or gtfo. Plus RP or die. Let the triggered shitter tears flow. Funny, coming from a fellow carebear! I hear you love goats, goat lover. Ideally you described it all, as I thought!